In this section, we're gonna do just what it says at the very top, which is breakdown of the math section. This is important to give you an idea of the different types of questions you'll see in the math or the quantitative section and the number of those questions. So what we're going to do is we're going to start with problem solving. Problem solving is your typical math math questions where you have a question and you have a series of answer choices. Traditionally you had five on the GRE, A through E, but with the new GRE, which is this GRE, problem solving's gone a little bit more fancy, as we're gonna see in the next slide. For now, though, know that problem solving is gonna make up the bulk of the math section about 60%. So there's a total of 40 questions, 20 per section, not including the experimental, and out of those 40 questions, 25 will be problem solving. Next we have the quantitative comparison section. And I think this is the one that really needs more explication, meaning toexplain that a little bit more if you're totally new to the GRE. And what I'm I drawing over here? Columns A and columns B. You will have a quantity in column A and a quantity in column B. This is a very stripped-down version of quantitative comparison, but essentially that's what it will look like. You are to compare the columns and see which one is bigger. And there obviously is an awful explanation of quantitative comparison. 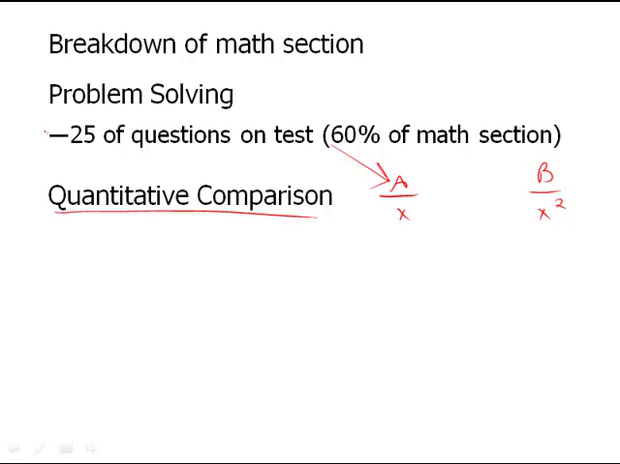 The point of this slide, of course, is for us just to look at the breakdown of the math section, not necessarily to understand each specific section But, if you feel tempted and you really want to know what is Chris talking about, what's this quantitative comparison? Then feel free to navigate to the lessons page where you can check out our many lesson videos and learn more about quantitative comparison. For now, though, what do we have to know about quantitative comparison? It's the rest of the test, 40 the math section, meaning out of the 40 questions, 15 of them will be quantitative comparison. There's 7 on one section, 8 on another section. So what is there left to talk about? Well, the thing is, the new GRE, when it changed a little over a year ago, the problem-solving became lot more complicated. They threw in all these new question types. And this of course had a lot of people freaking out. And honestly, it's not necessarily something to freak out about too much, but it's good to know what you're doing. First off is the numeric entry and I guess that's the one that was the most daunting for people. That's essentially where you you have a box. And that's all you have below the question and you have to input your number into that box, no multiple choices. So definitely a little bit stressful but It's also that interpitation. This is where you have the graphs and pie charts. And this is something you have on the old GRE. And even this can be a little stressful. I guess it depends really on what your strengths are. Next, something that they added, and I think for many people this one is really the most stressful or the most difficult or the most freaky, if you will. It's the multiple answer questions, meaning that you will have a question followed by as many as ten possible answers. So we're talking like, A, B, C, D, E, all the way down here to answer choice I and any one of these can be correct. And of course that is very daunting. But just know that these questions make up the problem solving section and that you will see them. You hopefully won't see too many of them. You'll only see a couple numeric entry. You'll see probably 6 data interpretation questions and a few multiple answer questions. One great thing, is when you go through our product, and you actually do a question, such as a numeric entry question, they'll say it you will see, you know, this many numeric entry questions per section. So they'll give you a better idea of just how many of these problem solving questions you'll see. But by far the most common problem solving question type is our good old five answer multiple choice. So you can kind of exhale, breathe a little sigh of relief there that what you're used to is actually the most common, and that again is a five answer multiple choice question.